When we think about blockchain technology and e-auctions, we usually visualize hi-tech items, phosphorescent green lines of code cascading down a jet black screen, and the like. The more humble and commonplace vegetables and olive oil do not readily spring to mind. Yet, blockchain technology and cryptocurrencies are slowly seeping through every aspect of life, including the agriculture market in the Mediterranean country of Greece. 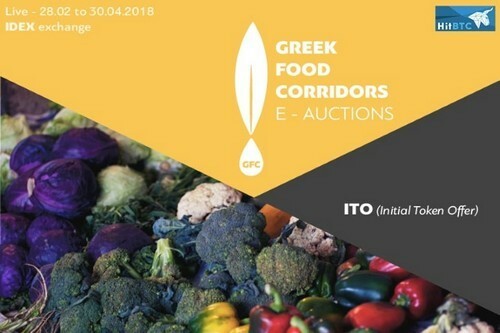 Today, we take a look at Greek Food Corridors (GFC), a brand new ICO that offers the creation of an e-auction platform for fruit, vegetables and olive oil to enable farmers and growers to sell their produce in a coordinated and fair manner. The current structure of the agricultural trade in Greece comprises a large number of small-scale farming operations and growers yielding produce. The concept of cooperatives is not widespread across Greece, accounting for about one fifth of production bases, as opposed to about 40% across the rest of Europe. The scattered and uncoordinated nature of the market means that growers and producers are at the mercy of wholesale intermediaries that buy their produce at a low price and sell it on at a much higher rate. Growers and producers are the losers in this setup, as they receive meager returns on their investments while intermediaries rake it in. GFC proposes a solution to this quandary through the creation of a e-auction platform that makes intermediaries redundant so that produce can be sold fairly and at a more adequate price. As with any other ICO, the company will issue its own currency, the GFC e-auction for Agri-commodities (GFC), which is based on the ERC-20 standard. Learn more about GFC’s team here. Here are the SM numbers for GFC at the time of writing (early April 2018). GFC’s presence on social media is practically non-existent at this point in time. Greek food is quite unique. It gives health, longevity, and beauty, if the legends are to be believed. Now, whether or not GFC also enjoys longevity is a matter for debate. What is clear however is that GFC is a unique ICO at this point in time. No other ICO offering an e-auction platform for vegetables & olive oil is currently in operation. From this standpoint, GFC has no competition whatsoever, so the opportunity is there. Consult GFC’s whitepaper for more information about the platform, additional features and services, etc. Whether investors feel the same way remains to be seen, but GFC does have the merits to succeed, insofar as it benefits mostly the small-holding farmer and grower who toil every day for their wages.